The Dementor Wasp (Ampulex dementor) is a species of cockroach wasp. It is native to Thailand and has red and black coloring. They are a parasitoid, known for preying on cockroaches, to incubate their eggs and to feed. The Dementor Wasp has a rather peculiar behavior towards its prey, cockroaches. The wasp will sting one on the head, releasing a toxin that goes directly to the neural nodes. The toxin will act as a blocker of the octopamine receptors of the cockroach. Essentially, this leaves the cockroach alive, but without the ability to control its own movements. While the muscle functions are still operational, the cockroach will run into the wasp nest, as if it was directed to do so. This allows for an easier capture. There is no explanation at this point as to what causes the cockroach to run into a nest as if responding to a call or notion. The science world has also coined a term to describe cockroaches that fall victim to the Dementor Wasp. Researchers who spent time examining the actions of pacified and poisoned cockroaches as being simply ‘passive zombies’ once the wasp venom reaches its goal and begins to take effect. Dementor wasps were only recently discovered and quite rare, so not much is know about them. Due to the destruction of their habitat, their convervation status is thought to be threatened. 1. The dementor wasp paralyses cockroaches with venom to the head, turning them into a zombie-like creature, with seemingly no free will of its own. Although the cockroach is capable of movement, they seem unable to direct themselves. In their zombie, or ‘drunken-like’ state from the deadly dose of neurotoxins, they will follow the wasps encouragement, directly into its burrow. 2. The dementor wasp will lay eggs on the cockroach to act as an incubator. 3. The dementor wasp was first discovered in Thailand in 2007, & named in 2014. 4. The dementor wasp was named after the soul-sucking ‘dementors’ in Harry Potter. 5. Its cousin, the emerald cockroach wasp or ‘jewel wasp’ has the same unusual behavior towards cockroaches, using them as a host for larvae. While they share the same behaviour, they are quite different in appearance and habitat. They emerald cockroach wasp is shiny-blue green, and mostly found in the tropical regions of South Asia, Africa, and the Pacific islands. The video below, shows a jewel wasp finding a cockroach host and going through complete metamorphosis from egg, to larva, pupa and finally transforming into a wasp from within. They genus Ampulex has 130 species which have a general ant-like appearance and mimic the way ants move. Some species are known to copy ants, as they can be considered unpalatable or aggressive by predators. While other ant mimicking is to help hunt ants. 7. The dementor wasps future is unknown, as their habitat is under threat. 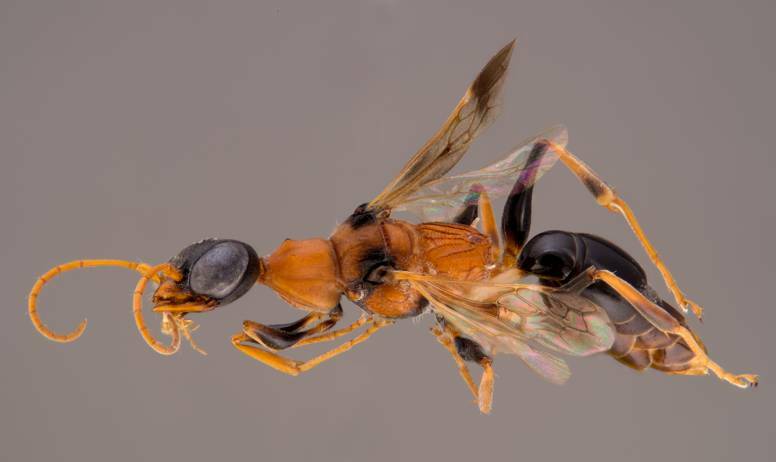 “Recently-Discovered Wasp Species Named For Harry Potter Creature”, via IFL Science. “”Dementor’ wasp among 139 new species found in Mekong”, via The BBC. “The Soul-Sucking Wasp by Popular Acclaim – Museum Visitor Participation in Biodiversity Discovery and Taxonomy”, via PLOS One. “‘Soul-sucking dementor wasp’ among new species already at risk says WWF”, via The BBC.